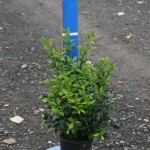 A dense, rounded shrub with glossy dark green leaves. In late winter to very early spring, the tiny white, sweetly scented, blossoms appear. The flowers are followed by round dark red fruit which ripen to black. Prefers shade to partial shade and normal to moist soils. Use as a single specimen or plant in drifts especially where the scent can be appreciated.